Happy new year! The Friends Of The Creek are keeping busy advancing the prospect of daylighting the creek through Sausalito, but also building partnerships around stewardship in the watershed, and supporting the teachers of the local public school in environmental, experiential education. Recent success in the City to protect the Lincoln-Butte open space next to Willow Creek’s neighboring creek to the north, spearheaded by the local group Open Space Sausalito, bodes well for our goals of restoring creeks, beyond just protecting what’s left. This January, we are substituting an on-campus Native Plant Garden project on Monday January 16, 2017 in place of the annual native planting by the creek. The new native plant garden will be on a sloped, central area, located next to the pilot garden beside the school admin. office that we designed and built in October 2016. 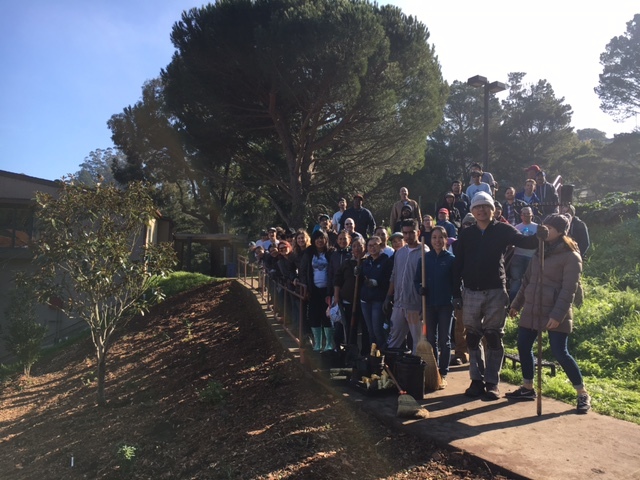 Volunteers from Heath Ceramics will be on campus assisting Friends and other parent volunteers in the vegetable gardens for a large workday effort to transform the campus. Our native plant garden is located adjacent to the underground creek on campus and will provide habitat for local wildlife as well as watershed friendly, native vegetation. These areas are uplands adjacent to creek channels that play a vital role in wildlife habitat and water quality protection. Please come join us on Martin Luther King, Jr.’s Birthday holiday to beautify the campus and restore the watershed of Willow Creek at the same time! Rose Foundation Grant – $4,500 – One Step Closer to Restoring the Upper Reach on Campus! The Friends were awarded $4,500 last month to further develop the project and build community partnerships around daylighting the “Upper Reach” of the creek on the Willow Creek Academy campus, and build an outdoor classroom in this area. This upper reach is currently a eucalyptus grove with ivy and poison oak, which is a large piece of land completely un-used by people, and the habitat is only good for tree nesting by a handful of bird species. The perennial creek is buried in a pipe through this dead zone. Our proposal is to remove the non-native hazardous trees, and replace them with a creek corridor and a riparian woodland including trees like cottonwoods, willows and alders. This grant will help the Friends lay the groundwork to get the improvements done on the school campus and build community around the first daylighted stretch through the city. The Upper Reach is located between the Fire Road and the pathway to Room 10, and is about 148 feet long. The Friends are working on applications for grants over $100,000 that can fund the tree removal and creek channel restoration work, in addition to outdoor classroom facilities and a community trail. Friends Board member and WCA alumni parent Amy Pertschuk is leading the effort to finance creek improvements, along with Emily Schmidt with support from all the friends. During the holiday break, Professor Matthew Cover of Cal State Stanislaus joined Friends of the Creek, Chair, Steve Moore to sampled benthic macroinvertebrates (i.e., aquatic insects & other critters) from the stream bed on the Willow Grove site. The population of insects that live in streams indicate the level of water quality. If there is a lot of pollution or concrete channelization, the creatures that live in the stream are less pollution sensitive, like earthworms and midges. Conversely, if the water quality is free of pollutants and the creek banks and bed are natural and vegetated, more pollution sensitive creatures can thrive, such as mayflies and stoneflies. Through sampling creek water they discovered that our Willow Creek has mayflies, stoneflies and prong-gilled mayflies. This means that the water quality is really high compared to other creeks in urban areas in the Bay Area and the state. This is wonderful news because it shows that the water in the creek is safe and clean, and worth protecting and restoring. Since the headwaters of Willow Creek are in the Golden Gate National Recreation Area (in the Rodeo Drive exit watershed), there is little disturbance of the water until it reaches Hwy 101 and the neighborhood and school. And it flows year round, a perennial stream even during the historic drought! Having such high water quality means it is safe for our kids to play in the creek, but also that it would be a great idea to daylight the creek through the Willow Creek Academy school campus for educational and aesthetic reasons. Having the creek wind its way through the school will reinforce our identity as the Creek Academy and our belief in experiential learning. Green jobs of the future will center on maintaining our water resources, among other areas like clean energy and transportation. This learning tool is an asset so valuable, and yet so hidden. Friends of Willow Creek will be hosting the fourth annual Earth Day Willow Creek Community Cleanup and Native Plant Restoration on Saturday, April 26th, from 9:00 am to 12:30pm. Each year, Friends of the Creek volunteers invite community members and families to join this annual event dedicated to clearing invasives and planting natives. Willow Creek is part of a growing network of restoration efforts in Marin County led by volunteers dedicated to restoring and enhancing our natural resources and raising awareness of the importance of maintaining clean water and healthy watersheds to support and enhance the wellbeing of the communities they serve. In Sausalito, Willow Creek provides a unique opportunity to restore, enhance, and maintain a vital asset for education and scenic enjoyment for generations to come. This year Friends of the Creek is extending a special invitation to families with children attending school or pre-school in Sausalito. Sausalito is now home to five schools and pre-schools including Willow Creek Academy, Le Lycée, The New Village School, Sparrow Creek Montessori School and the Sausalito Nursery School. 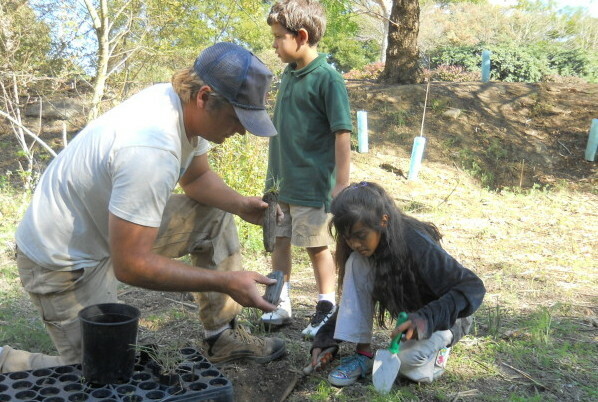 Willow Creek Academy (WCA) was the first school in Sausalito to integrate the Creek into their school-day across all disciplines including math, language arts and environmental education and WCA has played a key role in creek restorations to date. Friends of the Creek welcomes the opportunity to bring the benefits of creek stewardship to others. Willow Grove is located at the corner of Nevada and Bridgeway where the creek flows above-ground for a few hundred feet.The community has responded positively to the sustained success of these efforts and are eager to expand these effort this Spring. The Earth Day cleanup event takes place at Willow Creek on Saturday April 26th, from 9am to 12:30pm. Did you know that throughout this historic drought in California, the lowest rainfall in recorded history (about 150 years), our neighborhood Willow Creek has continued to flow year round? Q: How can this little creek flow year-round, when there was almost no rain between January 2013 and February 2014? Where does this water come from? A: The water in Willow Creek comes from condensation of the marine fog layer on the crest of the ridge above Sausalito. The dew collects on the leaves and the ground and slowly seeps through the ground to the creek. Since the ocean-based fog layer exists throughout the year including all summer long, it provides this year-round water source that gives us the gift of water flow every day of the year. Q: Has anyone ever invented a way to capture fog condensation to create water supply, especially in drought-stricken and dry countries near the ocean? A: YES. One company copied the Namid desert beetle’s ability to collect water in the desert (from South West Africa) to design a fence to collect fog condensation: http://www.wunderground.com/news/biomimicry-eight-ways-weve-copied-nature-and-gained-it-20140205?pageno=5 . Maybe someday we’ll build fences in California to get water from fog! The reason why we haven’t so far is because it takes a lot of fence (and a lot of money) to make enough water for how many people live here. But as we’ve learned this year, we need to be creative and conservative with our precious water, because we can’t live without it!